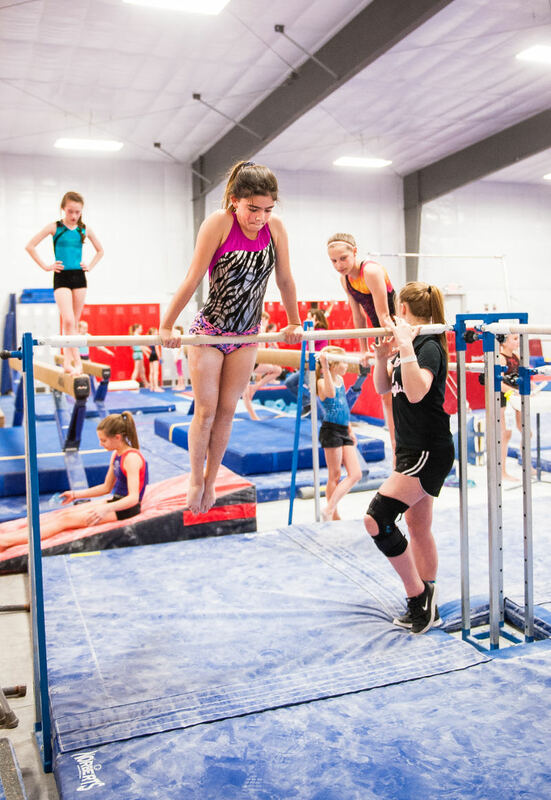 Helena Athletic Club (HAC) is dedicated to creating opportunities for athletic success, whether it’s in our foundational open gym programs, our popular after school programs, or our successful competitive gymnastics and cheerleading teams. We build well-rounded kids that are ready to take on the world in whatever form that takes. We believe that every athlete in our gym has the ability to excel at any level. We work to create individual paths and opportunity at all ages and abilities. Our classes are created for age AND ability levels. Not to worry if you have a child who found the sport a little later than others, we have beginner classes for all ages and levels. We want your child to be comfortable and well matched. Did you know that gymnastics and cheerleading are part of a small group of major sports that don’t have a dominant side? Using both sides of your body helps encourage balanced gross motor development. It also exercises both sides of the brain and helps cognitive development as well as physical development. That means, in addition to creating strong bodies, gymnastics and cheer develop strong brains too! Helena Athletic Club understands that your kids are involved in many sports and activities. We make it easy to come in and out of the gym as schedules allow. Maybe your child participates over the winter and then stops when baseball or softball starts up. That’s just fine. We bill monthly and there is no long-term commitment. Our philosophy goes way beyond back handsprings and cartwheels. We are about building positive people who walk away from our gym with the self-confidence, courage and work ethic required to succeed in life. Our kids learn that practice does generate positive results. They learn how to focus and listen to their body and their coach’s direction. AND did we mention, they’re having a blast?! HAC prides itself in providing the cleanest, safest and most comfortable sports facility in Helena. Consider this an open invitation to stop by and see it for yourself. Classes are held in the team gym from 4:00-8:00 Mon-Thurs and at Gymtrix from 9-Noon and 4:00-7:00. Our office staff is available from 4:30-7:30 p.m. Mon.-Thurs. No appointment is necessary, just stop by to see it all in action! 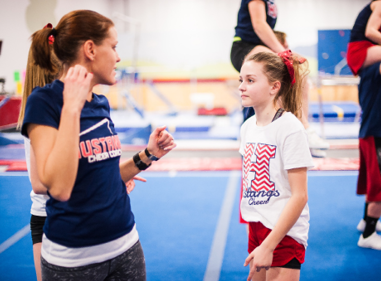 Helena Athletic Club is the perfect custom facility for youth athletics, in particular tumbling, gymnastics and cheerleading. From the first somersaults to advanced stunts and flips, HAC has it covered with its exceptional building and equipment. 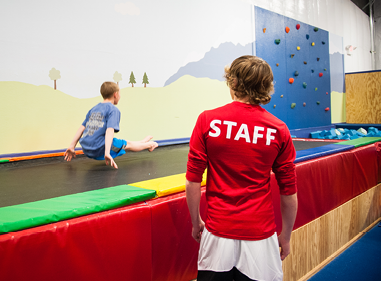 The 14-foot side walls and vaulted ceiling give us plenty of height from wall to wall for any flips, tosses and swings our students can dream of performing. Designing the building from start to finish let us include many helpful features like an inground tumble-trampoline, foam pits, and more! The spacious building also provides for another great amenity: a parent viewing loft. A set of stairs in the lobby leads you up to a comfortable platform from which to view all the action. This serves as a great convenience for parents to relax or corral siblings or for early arrivers to sit and do some homework. Our front office has friendly and professional staff, and a pro-shop stocked with everything from pony-tail holders to t-shirts and tanks tops. Free Wi-Fi is available for students and parents alike who need the access for some extra work-time while they wait. Besides the custom building, HAC has brand new equipment that includes a full-size spring loaded floor, tumble track with specialized landing area, 7’ by 14’ trampoline plus all FIG (the international governing body of gymnastics) regulation women’s apparatus: vault, uneven bars, balance beam and of course the spring floor exercise. The gym is also stocked with lots of elementary mats, shapes and training aides helpful for beginning to elite athletes. The 2 flat screen TVs allow for convenient viewing of entire routines or individual skills. Slow-motion and freeze frame capabilities gives coaches an additional tool when teaching new skills or working out specific elements of a skill. Along with the excellent equipment and technology, the gym layout allows for safe and easy traffic flow, for example, separating the advanced teams from the beginning classes. Let us help your kids grow and thrive!